Munich's Marineplatz was bustling with shoppers, street salesmen and a variety of side-show acts including ballet dancers and fire-eaters. 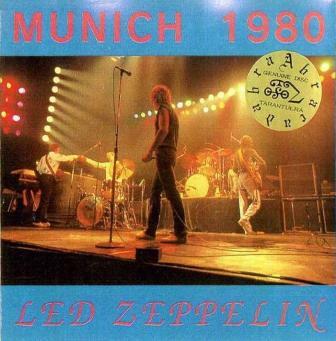 Contrasted with the discreet bourgeoisie were several denim-clad German youths displaying Led Zeppelin ephemera. 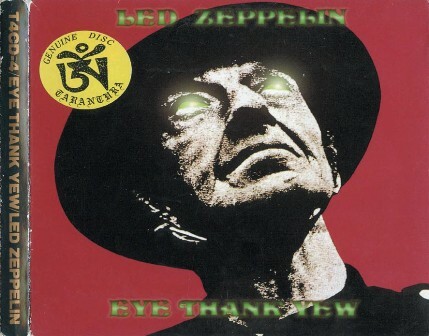 Noticing my Zep T-shirt a couple of them approvingly greeted me with: "Led Zeppelin! Led Zeppelin! Ja! Ja!" After a lengthy absence "the boys were back in town" and everyone knew it. Down in the U-Bahn (the city's underground train system) an array of fans was making its way to the gigantic Olympic Hall for the evening's concert. Meanwhile, several miles away at the Hilton Hotel, other Deutsch devotees were lurking in the lobby hoping to glimpse their idols. Earlier the band had appeared briefly to sign autographs but now were up in their rooms, closely guarded by security as they relaxed prior to the show. 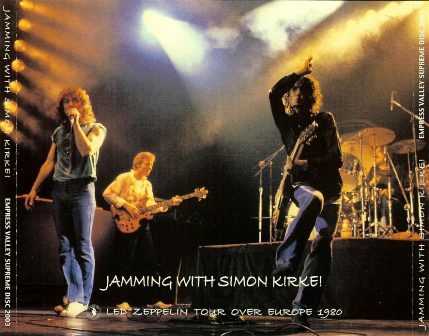 While Zeppelin fever has for the past few weeks enveloped the Continent, not a word has appeared in the English press on what marks the act's first tour for three years. A number of diehard fans have crossed the Channel in the past fortnight to witness the gigs - but there has been no media coverage whatsoever on Zeppelin's long-awaited return to work. Amazing, when one considers that the band are still by far the most popular outfit in the world. 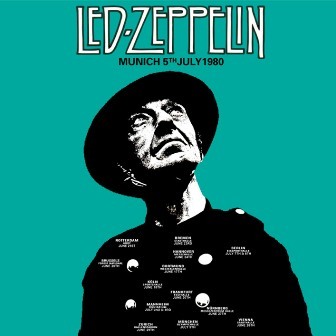 En route to Munich, encounters with a number of Zep fanatics revealed that the dates have been going extremely well. There seemed to be a feeling of total rejuvenation within the group. 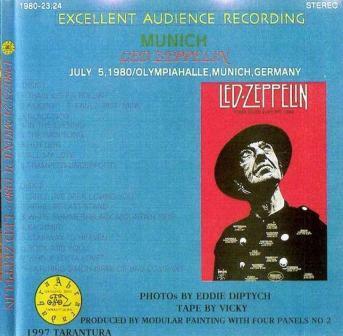 The majority of the concerts had sold out and the only minor problem had been the cancellation of the Nuremberg show due to John Bonham's sheer physical exhaustion. 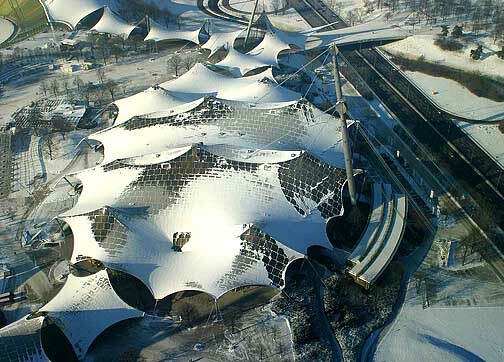 Munich's Olympic Hall was packed long before the band were due on at 9pm. Souvenir salesmen and the refreshment stands cleaned up during the wait, then shortly before nine kids were anxiously seeking vantage points to watch the gig. The auditorium is not dissimilar to Wembley, except that there is no seating in the Arena. Consequently fans surged forward to the front huddling together like the proverbial sardines, so that eventually the familiar figure of Harvey Goldsmith emerged to persuade everyone to move back. "This request will be repeated in German," he announced. It wasn't. I suspect it would have been ignored. 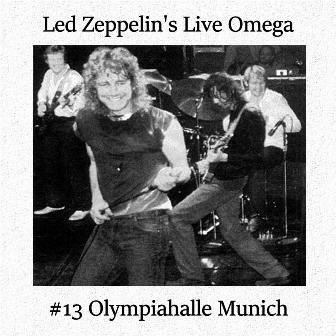 Just after a quarter past nine the houselights were switched off, the cue for Munich's Olympic Hall to erupt with more force than a volcano as Zeppelin were greeted with Teutonic fervour. In view of the uncertainty that the band would ever do another concert after Knebworth last year, this was indeed a magical moment. Fantasy soon turned to reality as the stage illuminated and Jimmy Page hammered out the beginning of "Train Kept A Rollin". It took some time before Robert fully unleashed, and at the start of the show it was hard to hear him properly, but once under way his vocal performance was tremendous. 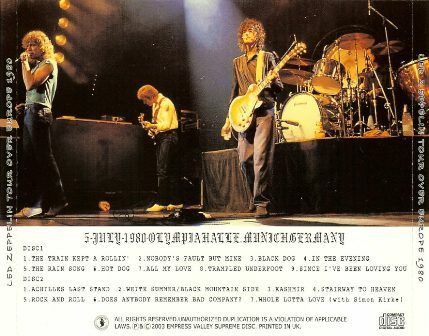 The second number was "Nobody's Fault But Mine", after which Page himself took the microphone to bid good evening to the crowd and introduce "Black Dog" - incredible but true, Jimmy Page actually speaks on stage! Indeed it was Jimmy, most of all, who epitomised the new-found enthusiasm of the group. His guitar playing was excellent - rough at times but any errors were covered by moments of inspired genius. Page dropped his trusty Les Paul in favour of a Strat for "In the Evening" which featured a marvellously serene keyboard passage from John Paul Jones in the slow section. He switched again to his twin-neck Gibson for the softer "Rain Song" and it was here that Plant really came into his element. The euphoric attitude of the band was communicated with the ensuing song "Hot Dog", and the country and western tune from "In Through The Out Door". Robert made continual pleas for the fans to spread out and ease the discomfort of those in the front, but like Harvey Goldsmith he was fighting an impossible task. The set had been altered slightly from Knebworth with "No Quarter" and Jimmy's violin bow extravaganza having been dropped. After "All My love" Robert once again implored everyone in the arena to move back, slipping in his familiar cries of "Push! Push! Push!" - this made an appropriate intro for "Trampled Underfoot". Again Page stole the show with sparkling lead breaks and some wah-wah at the end was possibly the finest guitar of the night. This was followed by "Since I've Been Lovin' You", a classic in its own right, which anyone who has ever witnessed Zeppelin live will attest is a gem in concert. Here Page and Plant shared the limelight with tremendous guitar and vocal blues. "This is the first tour we've done for three years," proclaimed Robert, "and it's certainly been an interesting sketch! And after this - well, who knows?" Following Plant's brief remarks the band launched headfirst into "Achilles' Last Stand" where Bonzo proved his talents as a sticks man. Next came Jimmy's guitar interlude, based around "White Summer" and "Black Mountain Side". He sat on a chair, alone on stage, but even then wasn't able to stop moving around. 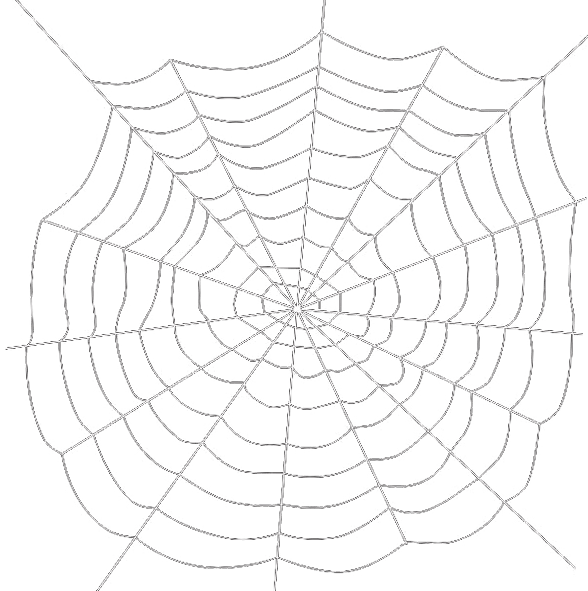 To me, this was the only tedious part of the show, which to that juncture had run very smoothly without any lengthy solos. 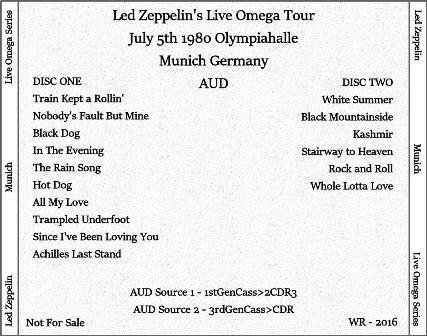 The whole concert reflected Zeppelin getting back to basics and I think perhaps it might be as well not to include the Page solo spot in order to sustain impetus throughout. Certainly Page has ample opportunity to show his skills during the set and in fact on the preceding number, "Since I've Been Lovin' You", he handled an elongated lead break. He finished his virtuoso display by leading into "Kashmir". 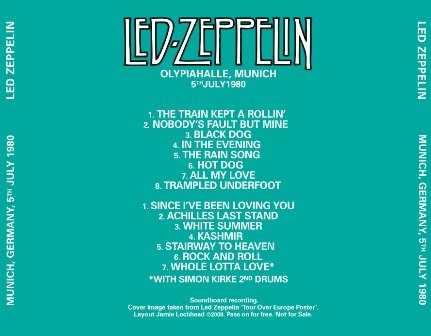 Then came the climax of the set as Zep played their anthem "Stairway to Heaven". Following the completion of the main set, another drum kit was set up on stage between Robert's mike stand and John Paul Jones' keyboards, which naturally bewildered the audience. Then, after a rendition of "Rock And Roll", Robert introduced Bad Company's Simon Kirke. Together the five musicians delivered an extended version of "Whole Lotta Love". Plant was accompanied by Page on backing vocals (!) and this made a fine ending to the show. When it was over, the band quit the stage to tumultuous applause. It was one of the most enjoyable gigs I have experienced and certainly the best this year. The group enjoyed themselves as much as the audience.